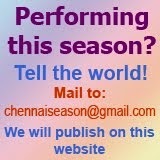 For me the season started with Madurai T N Seshagopalan at the Kartik Fine Arts. TNS was in good cheer and the two brilliant pieces vying with one another were the Nagaswaravali and Vijayasaraswati alapana. The brisk swaras at Saranam Vijaya Saraswati Maye, was a testimony to the veterans genius, which has been proved amply several times. Accompanied by M Chandrasekharan on the violin and Ramabhadran on the mridangam, this concert was a memorable one. I doubled it up with the masters' Music Academy concert, as its a yearly ritual for me, never to be missed. 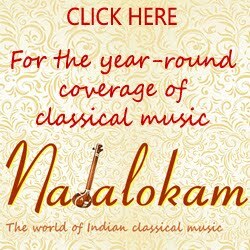 My pick was the Bhairavi raga and the Vachaspati swaras for Kanathandri naapai in the song Ennaduni, a Patnam delight. The Bhairavi raga could not have hid itself anymore, as every nook and phrase of the raga was explored by him, only to be followed by the beautiful Upacharamulanu. Here again he was supported well Delhi Sunderrajan on the violin , Ramabhadran on the mridangam and Grurprasad on the ghatam. Seshu-Seenu read the title of the evening programme at Krishna Gana Sabha. Multiple delight! 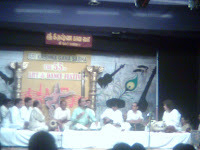 TNS and Mandolin Srinivas together with Guruvayur Dorai and Zakir Husain as percussion accompaniment. Though personally I felt that the title name was a little frivolous and that some other name surely could have been coined, I had to thank myself for attending this concert. What a fiercely fiesty combination that was ! All titans ! with prodigious leaps and powerful steps! Left one spellbound and stupefied ! Starting with an Abhogi varnam, the songs that followed were, Hamsadhwani ragam and Vatapi Ganapathim with swaras. A uniquely off beat kalapramana was chosen by TNS for the Anandabhairavi Marivere, which lent a nice pep to the otherwise peppy gait of Misra Chapu ! Samajavaragamana in Hindolam witnessed a short but imaginative neraval from TNS, followed by swara exchanges by both Srinivas and him at the line Veda Shiro ....!This was then followed by a very expansive raga alapana of Kalyani,by TNS,wherein he left no raga exploration untouched; with brief exchanges between him and Srinivas at a few places and at Tanam, before they moved onto a pallavi in Adi Tala sama eduppu : "Hare! Rama Krishna Govinda, Mukunda" . One may wonder that it is far too simple for the artists on stage. But then TNS put his imaginative, genius stamp onto this by doing various tala workmanship for this phrase, thus embellishing it fully ! The way he made a korvai with the word Govinda was impeccable. Mandolin Srinivas, proved that he was an intelligent master, all along, wonderfully giving the due respect to the larger titan by his side, at the same time displaying his mastery over the instrument. There were times when he just played along side, or made a nice frill of an embellishment or even kept quiet without playing or disturbing the flow of music. The Tani saw sparkling fireworks between the mridangam and tabla ustads. Words may not describe anymore of this experience. Wonderful concert indeed. But your review hardly does any justice to the concert. Shrinivas surely deserves more than "Mastery over the instrument". We all know that, it is not as if he started playing in the last decade. Be objective and impartial in your "Review"!